Dishwashers Direct are proud to present the KROMO Tray Washers which are the ideal answer for heavy duty workload and are recommended to businesses who need to wash and clean glasses, plates, cups and cutlery. 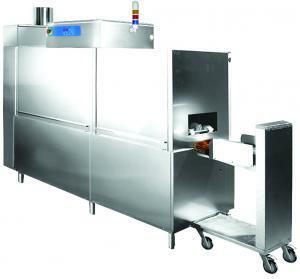 The KROMO TK1600 tray-washer has been designed to minimize energy consumption. The energy recovery uses the steam produced by the machine by pre-heating the infeed cold water with an immediate energy saving. The high productivity of the TK1600 combined with a customized twin-cords conveyor system, is the perfect solution to use the space at its best and to save on operating costs. The KROMO TK1600 will clean trays at the rate of between 6-12 metres per minute which equates to 1300 trays per hour. The KROMO TK1600 is delivered within 4 weeks and we would recommend that you use our qualified installation service. If you choose to have this dishwasher installed by Dishwashers Direct, we will provide you with 1 year FREE Parts & Labour Warranty. If you choose delivery only, we offer parts only warranty. You can choose to upgrade and extend your warranty upto 3 years including parts and labour. Delivery of KROMO Tray Washers usually take upto 4 weeks as they are delivered directly from the manufacturer. The price for this is included in the price of the goods unless otherwise stated. All deliveries are single man deliveries and are delivered to the door of the business.